Just bought one of these in silver at £32.50 i think they are a fantastic deal! Fasttech community has given this a solid 4.6 out of 5 from 96 reviews. Your comment is neither helpful or correct. I've tried Cleito120, coils never lasted. Best I got was 3 days before it burnt out. Cool fire IV with a Nautilus tank. I've had this set up the last 4 year's and never once had a problem. 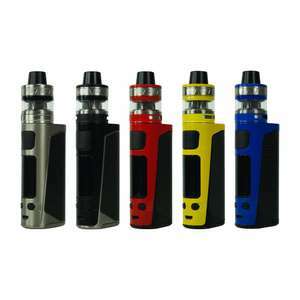 I have a smok 225w mod(18650x2) and a innokin axiom 3.5ml tank. Really happy with it. Currently vaping at 60watts. I've tried Cleito120, coils never lasted. Best I got was 3 days before it …I've tried Cleito120, coils never lasted. Best I got was 3 days before it burnt out. Great find - have some heat! I bought two, a black one and a silver one. Nothing else around that even comes close to what you get with this kit! Thanks. Looks ideal for the Zenith tank i ordered may get just the mod. Great find - have some heat! I bought two, a black one and a silver one. …Great find - have some heat! I bought two, a black one and a silver one. Nothing else around that even comes close to what you get with this kit! Thanks. Yeah it's a bit of a bargain mate, this is a genuinely good little mod for the money, would love to know why this deal went hot only to get hit with loads of cold votes!!?? Yeah it's a bit of a bargain mate, this is a genuinely good little mod for …Yeah it's a bit of a bargain mate, this is a genuinely good little mod for the money, would love to know why this deal went hot only to get hit with loads of cold votes!!?? There's a lot of anti smokers on here, that have now redirected their hate towards vaping. Vaping deals often down downvoted on here, no matter how good the deal is. Have my hot vote anyway to currently push it over 100. This or cool fire 4 plus? The mod is winging it's way to me from aliexpress for around £21. Cleito 120 can leak, as did the original Cleito. Mine leaks. Others report leaking too. The old Cleito (I have 2) leaks a bit too. Its a little more at around £45 but I have heard really good things about it. Does anyone have an opinion on whether this is better? Dna style profiles, proper stealth mode and gets rid of that awful analog style clock. It's worth flashing the firmware from here https://nfeteam.orgDna style …It's worth flashing the firmware from here https://nfeteam.orgDna style profiles, proper stealth mode and gets rid of that awful analog style clock. Totally forgot to mention about that on here, that firmware is awesome. On the contrary, voopoo drag and cleito combination is quite remarkable.